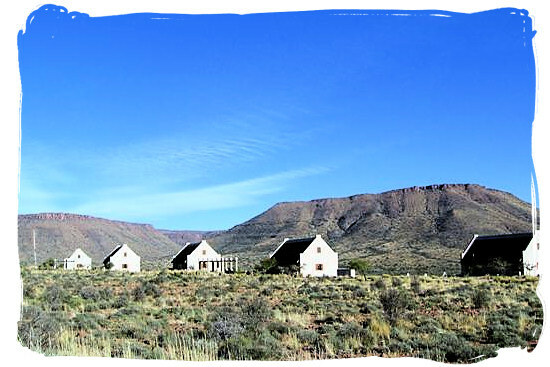 It is hot in the Camdeboo National Park, previously known as the Karoo Nature Reserve. Several Black Eagles drift around on the rising warm air caused by the heat on the valley floor below. They ignore us, intent as they are on spotting a rock dassie among the rocks on the slopes around us. The valley is barren and desolate yet fascinating, by what looks like huge perilously balanced dolerite pillars up to 120meters high, rising up dramatically from the slopes around it. Aptly named the "Valley Of Desolation", it is the prime attraction of the Camdeboo National Park. 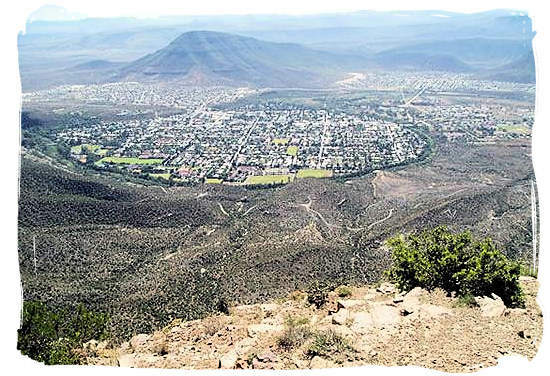 From the lookout point on Cave mountain one looks down on the historical town of Graaff-Reinette, looking like a map laid out on the ground. One can clearly see that the town is almost encircled by a loop ofthe Sundays river and the Park itself, as the river forms the boundary between the Park and the town. On the far slopes beyond the town lies still more of the Camdeboo National Park. Apart from its unique and dramatic landscape, the Park offers exciting flora and wildlife, together with highly interesting palaeontological sites. 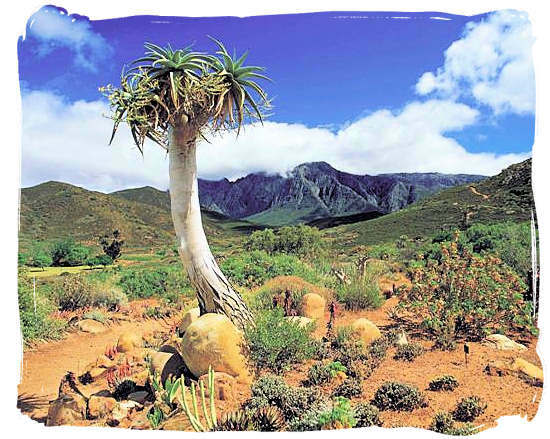 The Karoo Nature Reserve was established in 1979, when the International Union for the Conservation of Nature and the World Wildlife Fund recognised the urgency for conservation measures in the Karoo biome and listed this action as a world conservation priority. Renamed as the Camdeboo National Park, it was proclaimed as South Africa's 22nd National Park under the management of South African National Parks on the 30th October 2005. 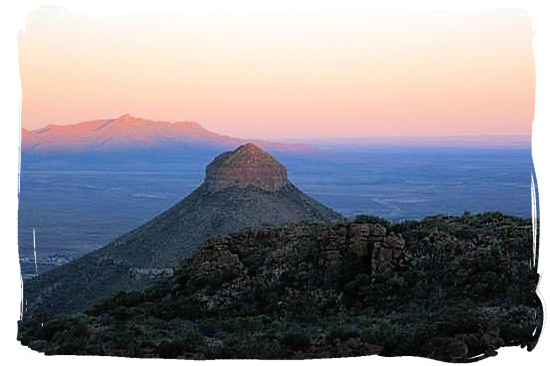 Although small, the Camdeboo National Park with its unique Karoo landscape and ecosystem offers an exciting variety of nature, wildlife and culture experiences. The Nqweba Dam lies within the park and covers about 1000 hectares when full. The greater portion of the Park is situated between 740 and 1480 metres above sea level on the foothills of the Sneeuberg mountain range. In addition a small section of the low lying-plains is included. The Camdeboo National Park lies in a circle just east, north and west of the Nqweba dam, which itself lies just north of the town of Graaff-Reinet. The Park offers walking trails that range from an hour to overnight hikes, as well as picnic sites for those who simply want to gawp at the majestic rock formations. 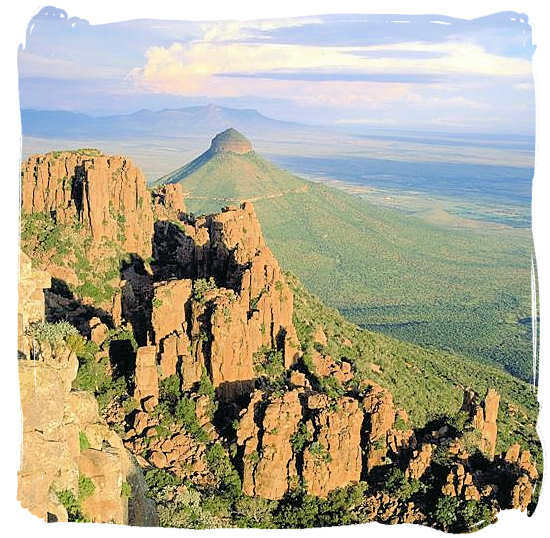 Almost encircled by the Camdeboo National Park, the historical 19th century town of Graaff-Reinet is a prime attraction in itself and well worth a visit. 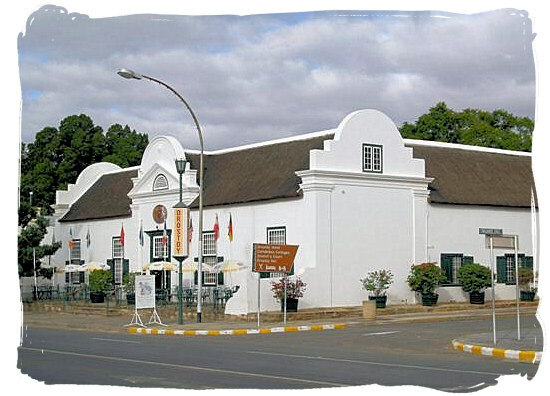 Established in 1786, the town was named after the Governor of the Dutch governor of the Cape Colony of that time, Cornelis Jacob "van der Graaf" and his wife "Reinet". As the fourth-oldest town in South Africa it is home to more national monuments then any other town in the country. 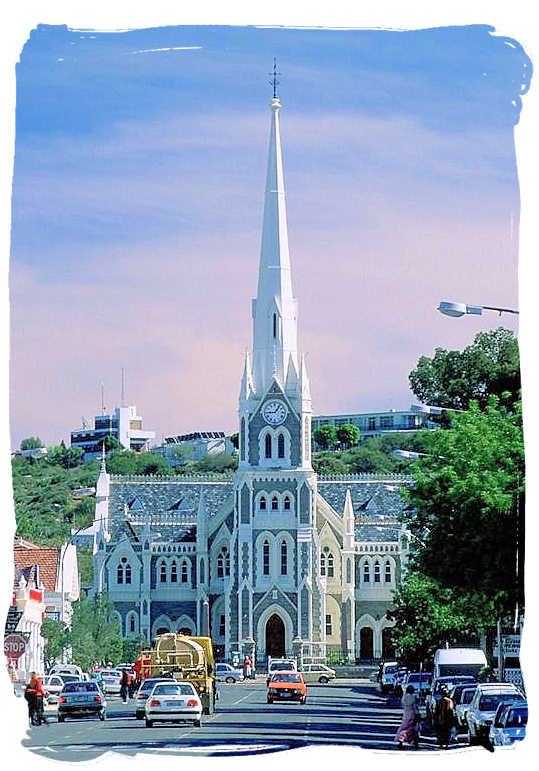 Graaff-Reinet also boasts many tourist attractions, from paragliding, micro-light flying, trout fishing, fossils search, golf and horse riding to mountain biking and guided township walks, to name but a few. 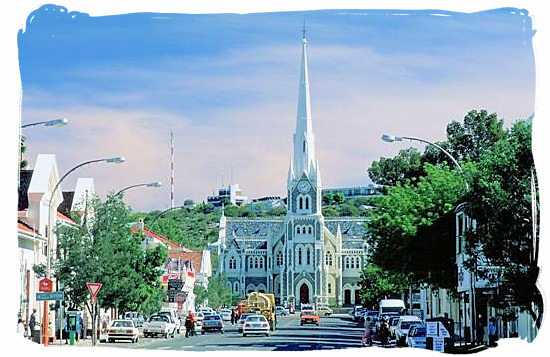 Graaff-Reinet offers old-world charm and traditional Karoo tranquility amidst all the amenities of a modern lifestyle. Its long history is on show for all to see, under big trees shading the pavement, along the long streets and in the whitewashed houses. The town has a distinctive wild-west feel, yet it is also a modern town with modern facilities. The streets are quiet and everyone is friendly. No one will bother you, but if you stop and ask someone a question, you will make a new friend. 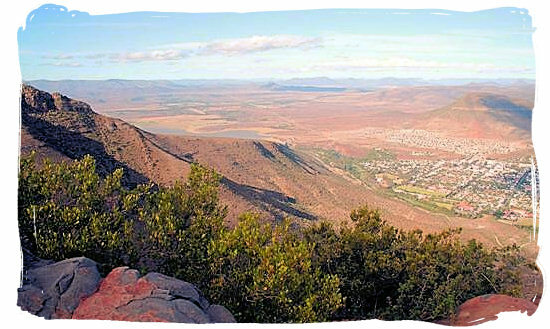 Called the "Gem of the Karoo", it is one of the most popular small towns in the country. 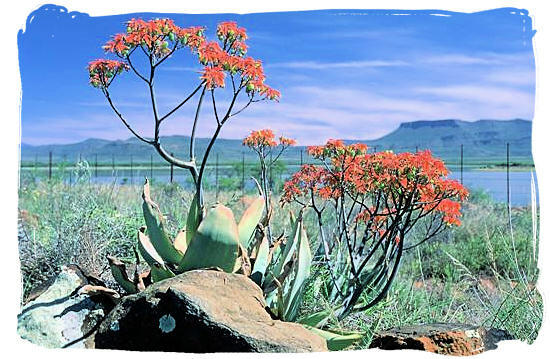 In the harsh and variable semi-desert Karoo climate of the Camdeboo National Park it is adapt or die for its plant life. The vegetation in the Park seems to be constantly battling to survive the extreme heat, extreme cold, severe drought, floods, poor soil types, brackish water and grazing animals, both wild and domesticated. In this process the plant life in the Park has developed wonderful ways to adapt and survive, such as highly specialised root systems, thorns and abilities to re-root from broken branches and to absorb and store water, amongst others. The diverse landscape of the Park in relation to altitude, aspect and soil type has led to the development of three distinct classes of vegetation, shrubland, succulent thicket and dwarf shrubland. 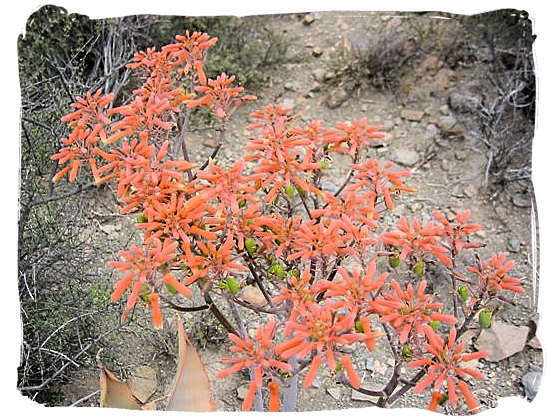 To date 336 plant species have been identified, among which 71 families of flowering plants. The most important of these are daisies (55 species), grasses (36 species), lilies (25 species) and succulent Crassula's (16 species). A wetland plant community occurs primarily within the water fluctuation area of the dam. There are 43 mammal species to be found within the Camdeboo National Park of which 11 are rodents and 13 carnivores. Game animals regularly sighted by visitors include Steenbok, Springbok, Blesbok and Black Wildebeest in the more open areas. Thicket inhabitants include the Kudu and Grey Duiker which are common as well as the less often seen Cape Buffalo. Red Hartebeest and Gemsbok are frequently observed in the transitional vegetation types. 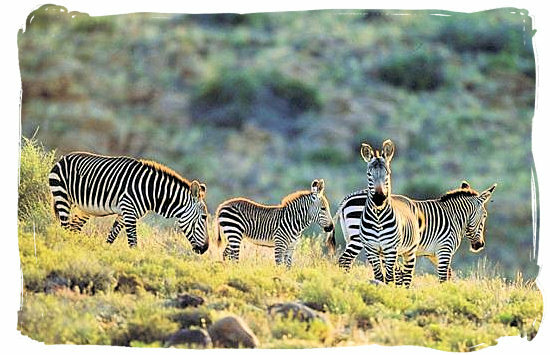 Cape Mountain Zebra may be seen from time to time, but they prefer the more mountainous areas of the reserve. At least 225 bird species have been recorded in the Park, with an interesting ecotonal mix including species typical of both the Great Karoo and eastern region avifaunas. 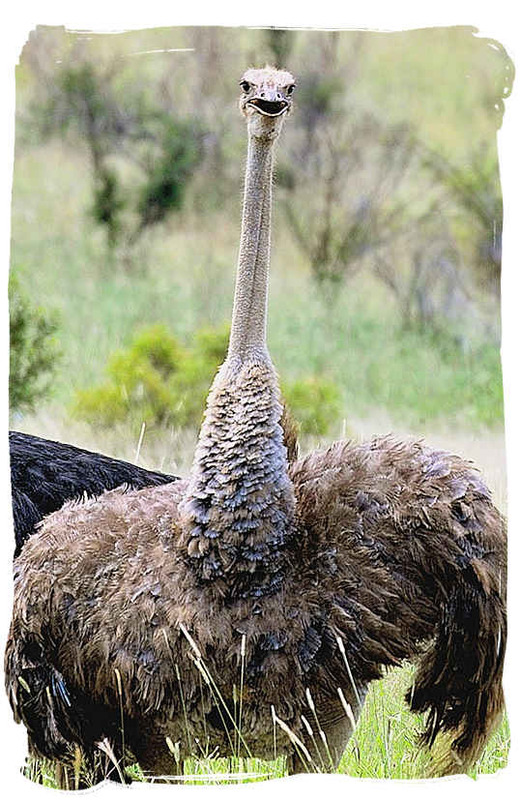 The Ostrich is perhaps the most well-known example of a bird adapted to life on the plains of the Karoo, it can cover up to 32km per day. The most common birds in the game viewing area are: Pale Chanting Goshawk, Rock Kestrel, Namaqua Dove, Diederik Cuckoo, Speckled Mousebird, Brownhooded Kingfisher, Cardinal Woodpecker, Lesser Honeyguide, Anteating Chat, Longbilled Crombec, Levaillant’s Cisticola, Neddicky and Titbabbler. Accommodation facilities run by the park are limited to a single hut used on one of the hiking trails and the Camdeboo Environmental Education Centre for school groups which can accommodate up to 40 children or can also be used for conference purposes. The town of Graaff-Reinet, basically lying in the heart of the Camdeboo National Park so to speak, would be the perfect place to look for accommodation. There are many good hotels and guest houses in Graaff-Reinet as well as a beautiful campground directly at the Sunday River. It is the ideal base from which to enjoy both worlds, the Park and the town itself with the dam and its surroundings. The people of Graaff-Reinet and its surrounding farms are renowned for their out-going hospitality, easy-going warmth and down-to-earth friendliness. Their warm personalities are reflected in their accommodation establishments. Whether you choose to stay in the historic town or on a farm nearby, you will be bowled over by great lodgings, a warm welcome and comfort you can truly relax in. Find the perfect accommodation for a memorable family holiday, a refreshing overnight stop. The Camdeboo Environmental Education Centre offers programmes to any formal group to promote awareness of and sensitivity towards the natural environment. Courses are tailored to meet visitors' needs up to a maximum of 40 people and may extend from one to four days. A nominal tariff is payable. This centre may also be booked for a team building or conference purpose. Gannalapa is an outdoor recreation facility development for use by the local community as well as tour groups who wish to hold a social function around picnic or 'braai' activities. It includes a bar, kitchen, toilets, braai circle with seating and picnic tables. 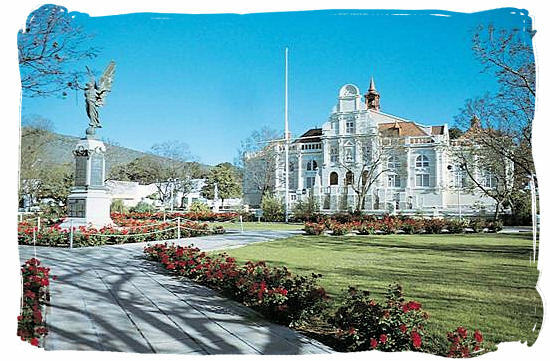 Comprehensive overview of all the facilities, shops and services that are available in Graaff-Reinet. Camdeboo National Park is located in a summer rainfall, semi-desert area. Summers are very hot with temperatures averaging around 31°C with peaks up to 40°C. During the summer months, visitors may want to confine their activities to early mornings and late afternoons, taking it easy around the swimming pool. Winters can be quite cold with temperatures averaging around 6,1°C, often dropping below zero at night. Most of the average rainfall of 336mm per annum occurs in summer and autumn, with a peak in March. Thunderstorms and high temperatures are common during the summer months while snowfalls can occur in the high-lying areas in winter. The interactive weather forecast for the Camdeboo National Park region, delivers condition, temperature, pressure, and wind information. It also allows you to instantly click over to detailed forecast information, radar images, and travel information. The nearest international airport is in Cape Town and the nearest domestic airport in Port Elizabeth. From Cape Town, take the N1 highway towards Beaufort West. 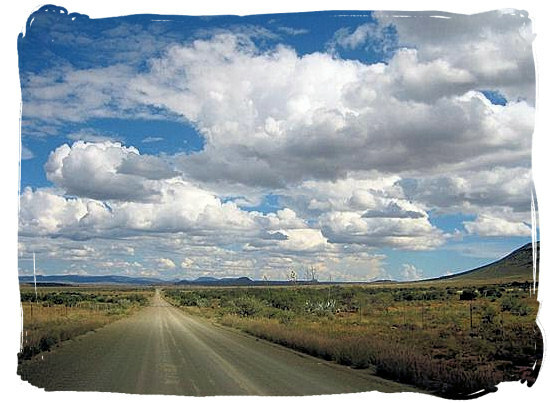 Pass through the town of Beaufort West and then turn right onto the R61 to Aberdeen. At Aberdeen, turn left on the N9 towards Graaff-Reinet. From Cape Town to Graaff-Reinet is approximately 600km. From Beaufort West to Graaff-Reinet is 209km. From Port Elizabeth to Graaff Reinet is 251km. When entering Graaff-Reinet, you will enter on College Road. If you want to continue to the entrance of the Park and the Valley Of Desolation, continue with College Road, which becomes Church Street. You will see the “Old Dutch Reformed Church” ahead of you. Vehicles can only turn left around the church and will then come to a stop street. Turn left at the stop street into Caledon Street and proceed down the street. At the four-way stop, turn right into the road towards Murraysburg. Keep going onto the road to the Valley of Desolation. The entrance to the park is 8km from Graaff-Reinet on the Murraysburg road.